Farmgirl Fare: Friday Dose of Cute: Baby Cary is Five Years Old Today! Friday Dose of Cute: Baby Cary is Five Years Old Today! Five years! Does time fly by or what? How about we take a trip down memory lane like we did last year? These are some of my favorite photos of Cary that were never posted until now. More photos and a Cary update below. . . I don't think the Nanny Bear has ever been as happy as when Cary was in his charge. Robin didn't feel quite the same way about her. My grown up girl is doing just fine. She's happy and healthy, and although she mostly likes to pretend she doesn't know me, lately she's been letting me scratch her back for several minutes at a time. As soon as I bend down and try to hug her, though, she's off. Thanks to all of you who have been asking about Cary having a baby this year. Because of almost losing her during her first pregnancy in 2008, I've decided not to breed Cary again. Last fall when our Katahdin ram, Edward, broke through 11 strands of barbed wire in order to get more girls, we thought Cary was pregnant, but thankfully it turned out to be a false alarm. As much as I would love to have a Cary baby, I just don't want to take the risk. Baby Cary is Four Years Old Today! 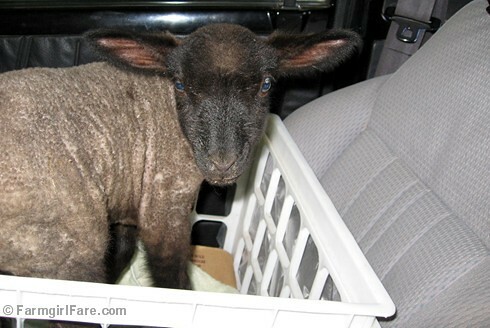 © FarmgirlFare.com, still loving the fact that for a while I had a lamb in the living room. My heart is in my mouth when I read Cary updates. Happy birthday, big girl. Sweet! Love pic of the Nanny Bear and Cary among the greenery on their own white pebble memory trail! I'm so glad to see her doing well. I was wondering if she hung out with you anymore. I guess she is a grown-up girl! Happy birthday, Cary. I remember when you were born and it has been a joy to follow you all these years. Here's to many more. Can't believe it's already been 5 years! I'm sorry, but it's impossible that she's 5 years old already. Because that means I've been reading your blog for 5 years and still haven't cuddled any of these sheep OR Bear - who is so adorable in that tongue-hanging-out photo with baby Cary. Criminal, the cuteness around here. And a belated Happy Mother's Day to you, Farmgirl - you two are lucky to have each other.